Hilarious from start to finish with every bit as much heart as the original. Made for fans of the Lego movies and anyone else just looking to laugh their bricks off. Whether working in animation or live-action, Phil Lord and Christopher Miller seem unstoppable. Starting with Cloudy with a Chance of Meatballs, they’ve graced us with everything from two Jump Street films, Spider-Man: Into the Spider-Verse, and a glutton of LEGO films: The LEGO Movie, The Lego Batman Movie, and The Lego Ninjago Movie. 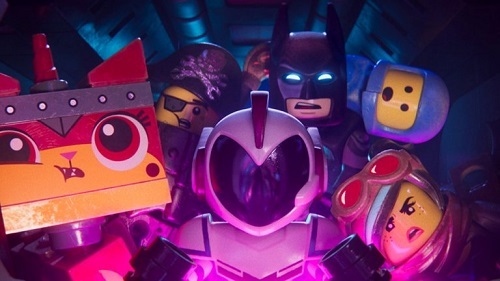 With The Lego Movie 2: The Second Part the streak continues, proving sequels can be every bit as good, if not almost better, than the original. With the big twist out of the way, the duo have a whole new way to play. The DUPLOs have landed, and Bricksburg will never be the same. Five years after wreaking havoc and destroying the city, Emmet (voiced by Chris Pratt), Lucy (voiced by Elizabeth Banks), and the remaining citizens, have escaped to build anew in Apocalypseburg. But just wouldn’t you know it, while out brooding, Emmet draws the attention of a whole new set of invaders. Now, General Mayhem (voiced by Stephanie Beatriz) has taken Lucy, Batman (voided by Will Arnett), Unikitty (voiced by Alison Brie), Metalbeard (voiced by Nick Offerman), and Benny (voiced by Charlie Day) deep into the Systar System. Here, they come face-to-face with Queen Watevra Wanabi (voiced by Tiffany Haddish) who happens to be planning a matrimonial ceremony while Emmet teams up with the dangerously mysterious Rex Dangervest (also Pratt) to save his friends and stop Our-Mom-Ageddon! Since we know our favorite band of misfit Legos are being played with — Finn (Jado Sand) now being joined by his sister Bianca (Brooklynn Prince) — the tonal shifts could give some viewers a headache. It’s really a brilliant move to further Lego mythos while delivering an even more heartfelt — and at times even sadder — message. While the first Lego wound up being the story of a boy just wanting quality time with his dad, here we get to see how a sibling rivalry can assault our favorite brick characters. The animation is every bit as stunning as the previous Lego films, and the introduction of additional Lego lines makes for some hilarious new characters. Pratt is living it up getting to play two different versions of who may or may not be the same characters, and everyone else — including the new voice cast — gets to crack wise. While The Lego Movie 2 manages to hit the sibling rivalry nail right on the head, it’s also a joke-a-second laugh factory. The film is so packed with jokes that it almost feels like it could be too much for one movie. A running gag involving Bruce Willis — and Rex’s Raptor pack — almost steal the show. The Lego Movie 2 wants to have its cake and eat it too and it’s a fantastic feast from start to finish. Thankfully, Warner Bros., Lord, and Miller — along with director Mike Mitchell — didn’t rush to get a sequel pushed out the door. It really has been five years since the original came out and The Second Part meets and exceeds expectations across the baseplate.